FILE - People walk as security forces travelling in a truck patrol a street in Gagnoa in western Ivory Coast, Dec. 2, 2010. The last time Ivory Coast held a presidential poll, then-President Laurent Gbagbo refused to accept defeat, forcing the West African nations into an ugly civil war. The conflict, which killed 3,000, is casting a shadow over this Sunday's election. Echoing through the streets of Gagnoa, the former president's stronghold, a campaign song lists all the promises that current Ivory Coast President Alassane Ouattara says he will implement if he wins the upcoming election. The sound comes from the local headquarters of his party: a massive building several stories high, with giant campaign posters plastered across it. Here, local campaign director Andre Logbo says the campaign is doing just fine. "[Gbagbo's supporters] have not been insulted, not even when they were campaigning in villages," Logbo said. "Maybe people have come to understand the principle of a democratic election." There were reasons to worry about clashes. 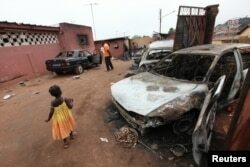 FILE - Burnt cars are seen on the yard of Soumalia Savane, a supporter of Laurent Gbagbo, Ivorian Popular Front (FPI) presidential candidate, in Gagnoa, Nov. 29, 2010. During the last election in 2010, Gbagbo backers and Ouattara supporters fought for months after both candidates claimed victory. Gbagbo was eventually arrested and Ouattara became president. 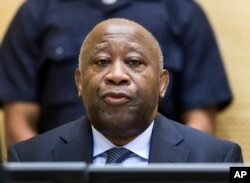 FILE - Laurent Gbagbo, ex-president of Ivory Coast, stands trial for his alleged role in the civil war in that country. Gbagbo is now awaiting trial before the International Criminal Court, but simmering tensions remain in his native area. Last month, opposition supporters protested against Ouattara's candidacy, saying it is unconstitutional. Inter-communal clashes afterward left two people dead. 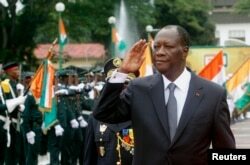 A couple of weeks later, Ouattara came for a visit and called on people to reconcile. Traditional chief Joseph Gadji Dagbo echoed that call and asked the president to forgive the Ivorian people, stating that compromise is the only way to reconciliation. FILE - Ivory Coast's President Alassane Ouattara salutes during a parade to commemorate the country's 54th Independence Day, outside the presidential palace in Abidjan, August 7, 2014. The chief says one group won and another group lost, but no one should remain mired in this squabble that keeps people in jail. "So they asked for forgiveness. And they asked so well that, for the first time, Ouattara also admitted his responsibility in the conflict and also asked for forgiveness," he said. But in Gagnoa, some Gbagbo supporters claim there cannot be any reconciliation unless Gbagbo's old allies are allowed back on the streets. "There has never been a beginning of reconciliation in Ivory Coast, because the two warring parties have never really been brought to the same table," says Guika, interim local secretary of the FPI, Gbagbo's former party. Guikaq says there still are a lot of people in jail or in exile, so "if one wants free and peaceful and transparent elections, everybody should be allowed back." The party official says the list voters will get on Sunday is full of mistakes and should be reviewed. He adds that Gbagbo supporters feel sidelined and angry. "Frustration feeds rebellion, and today, the youth feel unjustifiably left out of the elections. That can trigger reactions that we can't control," Guika said. 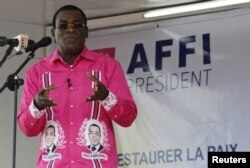 Guika does not support Pascal Affi N'Guessan, who claims to be the official candidate of the FPI. The party split into two factions recently, between Affi supporters and pro-Gbagbo hardliners who demand the former president's release. If nothing changes, Guika says Gbagbo's supporters should boycott the vote. Pascal Affi N'Guessan, leader of Ivorian Popular Front (FPI), speaks during a campaign rally in Gagnoa, Oct. 10, 2015.